The positions were nearly impossible to fill, until Santa Clara Valley Transportation Authority (VTA) decided to "grow their own." Now, six new Overhead Line workers are ready to take on one of the most sensitive and potentially dangerous jobs in the transportation industry, having just graduated from a two-year apprenticeship program with flying colors. The Overhead Line Worker Apprenticeship is part of the VTA/ATU Joint Workforce Investment (JWI) program. This labor and management collaboration trains and mentors employees in an effort to fill vacant jobs from within the agency and retain workers in an industry with traditionally high turnover. Overhead Line workers oversee and maintain the overhead electrical wires for VTA’s entire 42-mile light rail system. Those electrical wires, which power the line, carry close to 1,000 volts of electricity. The graduates are filling positions that had been open at VTA for more than five years. 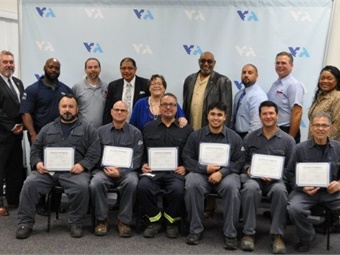 “Given the highly skilled aspect of the job, we haven’t been able to find the kind of talent from outside the agency that we needed,” said Steve Jovel, the VTA assistant superintendent in charge of the apprenticeship program. To that end, the JWI decided to create its own training and apprenticeship program for overhead line workers, in addition to the apprenticeships already in existence for bus operators, track workers, mechanics and light rail operators. The graduation allows these six workers to now work as full-fledged overhead linemen, still retaining the relationship with their more experienced ATU mentors for any guidance and encouragement they may need along the way. One notable member of the new graduates is former VTA Bus Operator Tim Watson. You may remember Watson helped to thwart the kidnapping of a four-year-old boy in 2015 when he received an emergency alert while driving his route. He noticed the suspect and the child on his bus and deftly put into action previous training he received in human trafficking awareness, which led to the child’s rescue and the suspect’s arrest. Watson has completed three of the certified apprentice programs at VTA, graduating with the overhead line workers…ready to take on a new step in his career. The VTA/ATU Joint Workforce Investment Program is a national role model working with transit agencies around the country looking to develop similar programs.